There are many factors that could trigger someone’s allergy. Doesn’t really matter if they just stay at home. And one of the few causes of such is when you’re not cleaning your house properly. Allergens like dust mites, mould, cockroach droppings and pet dander are the common factors that trigger an allergy. In fact, more than a million suffers allergy at home. Allergens are carried in through air and can be commonly found on floors, furniture, beds, and other surfaces around your house. As a matter of fact, there is no such place at home that can be completely allergen-free. But through efficient house cleaning, you could help reduce these number of allergens. Hence, this house cleaning tips 101 will help you get rid of allergens that may trigger your family’s allergy. Check this out and be ready to breathe easier from now on. One of the best ways to control allergens like dust mites is by getting rid of the dust. As a matter of fact, dust mites are the most common trigger of allergy and asthma symptoms inside the home. So, getting rid of it will help reduce allergy attack. However, be aware that improper dusting could make things worse especially if allergen particles spread into the air. Make sure to follow the dos and don’ts of dusting. Or better yet, you could ask professionals for best home cleaning tips to achieve the best results. Another cleaning tip that will help reduce allergens is through vacuuming. A regular vacuum session in areas that accumulate more dust like carpets, furniture, and floors could help control allergens in your home. But the same thing with dusting, a wrong way of doing it could also send dust particles into the air. And the worst case could cause problems for anyone with a dust mite allergy. Likewise, we suggest using a vacuum with an air filter which can capture small particles. It also helps to prevent the dust from spreading in the air. Just make sure to at least schedule your vacuum cleaning once or twice a week. Dust mites tend to thrive in throw rugs, pillows, couches, and beddings. Considering that we often spend our time in the bedroom and couches. So, it is important to secure these areas. Reduce the allergens to those places. You may schedule washing your pillow cases, bed sheets, and blankets in a very hot water and dry them in a hot dryer to kill all the dust mites. Do this for at least once a week. You may also include encasing mattresses and non-washable pillows, comforters, and other beddings. Most of the cleaning chemicals found in common household cleaners can trigger symptoms in many people who have allergies and asthma due to its strong smell and content. And if you are sensitive to allergens, try changing your house cleaning products. Use environment-friendly clean-up supplies that has natural and plant-based ingredients in it is a good option. 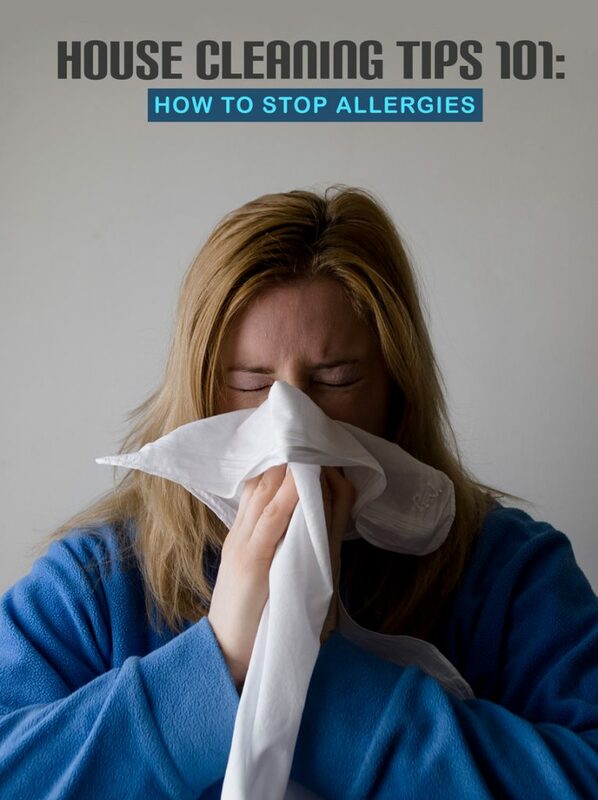 By doing so, this will help you to avoid triggering your allergy. Fortunately, in today’s trend, there are many options for people who are looking for green cleaning products. And if you want to save more money for this cleaning product, you can make your own! Using ingredients like vinegar, baking soda, and lemon as your mixture is a good way to improvise. Many people that are allergic consider the protein found in saliva, urine, and dander of our pet friend as a common allergen. These could trigger allergy symptoms. Yes, these allergen particles could become airborne and trigger symptoms in those people who are sensitive. However, you could reduce animal dander by vacuuming and washing your pet at least once a week. Or you could take other measures like keeping your pet out of your bedroom and off the furniture. Designating certain areas of the house as pet-free zone could also be a good move to reduce pet dander. The most common damp areas that moulds and mildew thrive in are in the bathroom and basement. Well, these mould spores could also float in the air like pollen and possibly trigger allergy symptoms and asthma. So, to minimise these allergens in the bathroom, replace wallpaper with tile. Or you could paint the walls with a mould-resistant paint. Also, don’t forget to run the exhaust fan after taking a bath. Or you could towel-dry the shower or bathtub itself to avoid the build-up of moulds. Also, take time to scrub them off from tiles and bathroom surfaces. Don’t forget to replace shower curtains regularly. The same thing goes with the basement, regularly clean it off the walls and consider having a dehumidifier to reduce moisture if it’s damp. Cockroach droppings are also considered as one of the allergens that could trigger allergies in some people or worst case could cause illness. Well, to eliminate cockroaches and other pests in your home, you could use traps and baits. You could even try boric acid rather than chemical pesticides which may aggravate asthma and allergy symptoms. You could also control cockroach infestations by storing food in tightly sealed containers. Also, make sure to promptly dispose of all food rubbish. Cleaning your home regularly and thoroughly will get rid of any lingering cockroach waste and other pests that could trigger allergies. Allergies can’t stop but preventing allergies to trigger is possible with this house cleaning tips. Get rid of all the allergens in your house and breathe freely without worrying of your allergies to attack. Make your home an allergy-proof home. Make it a safe and healthy place to leave in for your family. Looking for more helpful cleaning tips? Check out our blog section today for more useful insights about cleaning. Or call us today for more details and learn the other cleaning services we offer. Maid in Perth will be happy to serve your needs. Also, are looking for a residential cleaning service? Then this article is right for you, Customer Awareness Guide from Professional Residential Cleaning Service Company.